February is here, and I’ve realised that I haven’t updated my blog for over a month – this is my first post of 2009. I’ve been busy practising my spinning. Here’s one of my current spinning projects. It’s an alpaca silk blend from World of Wool on a 2 inch olivewood whorl spindle from IST crafts. 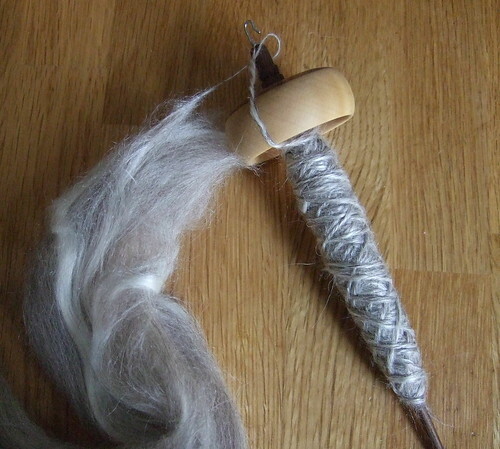 The fibre is beautifully soft and the spindle is lovely.It spins really well and the whorl has a lovely olive oil smell. I finished my first handspun handknitted socks last week. 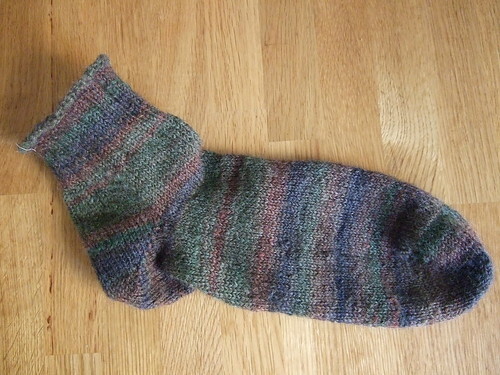 These were my first toe up socks. I used the universal toe up pattern from Knitty.com. I really enjoyed knitting them, once I got the hang of the short rows. 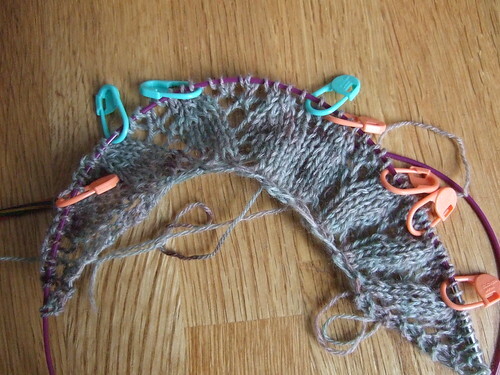 I’ve also started two new non handspun knitting projects. The first is the Bog Jacket from Knitting Around. It’s basically endless garter stitch, but has an interesting construction. A nice mindless pattern so far. 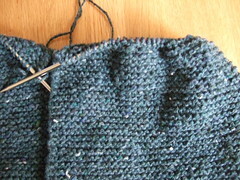 I’m using Texere Troon Tweed yarn reclaimed from another project. I’ve also started a Japanese Feather and Fan Shawl with the Knitwitches Heavy Laceweight Cashmere I bought from last years Knitting and Stitching Show. This pattern requires a bit more attention, but I think it will be beautiful when it’s finished. What beautiful projects! Nice work. What joy – to knit from your own spinning! someday… they’re really lovely socks. Wear them in good health!